Superb single track, stellar view and challenging running terrain greeted 21 footracers out Corral Creek east of Sun Valley for the Nasty 9 Trail run, second event in the three-race Wood River Trail Run Points Series in September. 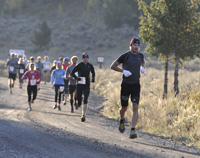 Repeating their Harriman Trail Run victories achieved Sept. 7 were series leaders Tom Liby of Boise (1.06:00) and Angenie McCleary of Ketchum (1.21:40). Next in the series: The Baldy Hill Climb on Sept. 27.